Littlest Sweet Shop: September New Arrivals - Swiss Roll slices, Rainbow cake and Ice Cream, Mango Pudding, Iced Teas, Cherry Bakewells and more! September New Arrivals - Swiss Roll slices, Rainbow cake and Ice Cream, Mango Pudding, Iced Teas, Cherry Bakewells and more! Our new arrivals for September is very colourful and sweet! We even made some new drinks and English style treats for tea time so I hope you like them all. Our first new arrivals can be found in the Beverages menu. These Iced Teas are topped with fluffy and realistic looking whipped cream and can be decorated any way you like it. The cup and lid has also been handmade by us to give you miniature take-away cups made from the same materials as the original sized ones. The cups have great clarity and you can even remove the lids if you wish. Our next few items are quintessentially English. Littlest Sweet Shop is based in England so I think we need to stock up the shop with more local items! Each butter jam cookies are hand-piped like the real thing so they are all unique. We made the jammy middle using resin which is very clear and shiny in contrast to the delicate buttery biscuit it sits on. At Littlest Sweet Shop we make jams in all colours so you can sample every spectrum of the rainbow. Available now in the Cookie Shop. Next new item in our Cookie Shop is a favourite of the Queen of Hearts. These Heart Jam Tarts are perfect for your Alice in Wonderland theme party or any English style tea party. The jam in the middle looks very sticky and sweet. Our last new item in the Cookie Shop is called Viennese Swirls. They are made up of 2 biscuits with jam and butter-cream sandwiched between them. The biscuits are also hand-piped, just like the real thing! Cherry Bakewell tarts was created in England so we had to create some for our Bakery menu. Ours is the miniature version of the ones made popular by Mr Kipling. Each tart is filled with white icing with a cherry in the middle. Let's debut something inspired by Japan again! Our Deco-roll cakes were so popular when we launched it last month so we made some new designs. They are now listed together with all of our Deco-rolls in the Cakes menu. 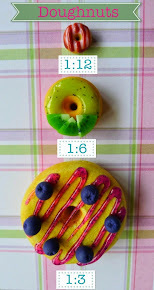 Fruit Deco-rolls and rainbow Deco-rolls. Our fruit Swiss-Rolls cakes have fruit bits throughout the entire roll. We have made Matcha Swiss-roll cake with mango and cream and Chocolate Swiss-roll with strawberry slices and cream. They are both a very cool and refreshing dessert - perfect for summer. Some clients don't want a whole Deco-roll cake, so we made individual slices for them! Any rainbow Deco-roll cakes now come in individual slices. Individual slices of Pastel rainbow Deco-roll cake. You can even order the slices in plain Swiss-roll flavours. They have also been listed in the Cakes menu. Each piece looks so fluffy and light with a delicious whipped cream middle. We made a new Rainbow Cake and decorated it with lots of rainbow candy buttons all around. We used a new recipe for the frosting as well which looks like a very thick but light whipped cream. This cake is now available in the Cakes menu and can be ordered as a whole or as an individual slice. Rainbow cake with rainbow candy buttons. Order a whole cake or just a slice - up to you! After making that colourful rainbow cake, naturally we wanted to make more rainbow items. So we made a tall 7 scoops rainbow colour ice-cream! It's been ages since we've had new items in our Jelly / Gelatine menu so here are some new Mango Puddings! We actually made more new jelly products but let's debut these first. Each mango pudding is layered with a light and fluffy cream and topped with a mango jelly with some mango pieces. Each pudding is garnished with mint. Our last new arrival of the day is the Cinnamon Roll. These freshly baked sweet rolls are now available in the Bakery menu. Each sweet roll has a layer of cinnamon throughout and topped with flaked almonds. The top is glazed with icing. We are so busy at Littlest Sweet Shop these past few weeks. We have been commissioned to do a Christmas Dinner for a museum in America so that is pretty exciting! Everything is going smoothly so far so you can expect some new items for Christmas very soon. Congratulations to both of them and I do hope they enjoy their prizes. We now have over 2k followers on Instagram so we promise to do another big giveaway once we reach the 5k milestone! Keep following us to make sure you don't miss out.